I told myself not to ramble about my daily life at school and here I am at it again..^^. I hope that this won't bore a hole in anyone's mind. Yikes.. I should have been memorizing the vocabularies instead of writing here. aigoo.. 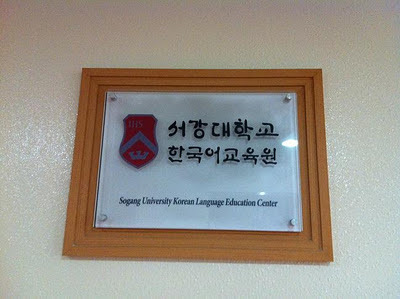 The plaque at level 4, Sogang building where my class is now. Free newspapers in front of Dong Incheon Station. but I told her that I wouldn't understand most of it. handsome face while riding the train. Sweet right? haha.. It's the third day today in Sogang University! Me and Min Young's mother took a bus to Dong Incheon Station and she taught me how to ride a speed train (급행 열차) to Sindorim Station. The train will stop only at major stations and that means faster. But still..1 hour 30 minutes. I went out at 7am and reached school at 8.30am. I am fine with it as I can do some lesson preparation (예습) and review (복습). Class run as usual for 4 hours and there's one little finding that intrigued my mind. Am I being too observant? hmm..During 말하기 class, the teacher instructed us to go to the next class for self introduction and get their contact details as well. I will be damned If I didn't feel anything . I was awed by how naturally fluent they speak and were really at ease in doing the self introduction, mingling..lalalala after speaking to at least four person. So I had this thought consciously, "They are also Level 2 students and why me or even my classmates are not speaking as fluent as them? Why they are different and way better than us?" So I discussed this with Julia and we came to a conclusion: we have to double or triple our efforts. The lovely Shin She Kyung - free magazine courtesy of Julia. After class we had lunch together at the campus cafe' and I just bought some bread and soy milk instead. Actually I was really starving at about 11am but I could eat nothing from the cafe'. T_T. Anyway, after lunch we went to Arrupe Hall to pick up our students card but Mr Kim told us it would be ready only on Wednesday. So Julia and Eden went to Bandi and Lunis for Sogang Workbook while I accompanied Brennan to print his stuff for kindergarden's students. Printing in Sogang University is FREE. You just need to bring your own paper. Nice!! Afterwards, Julia and me walked around school while waiting for Min Young. 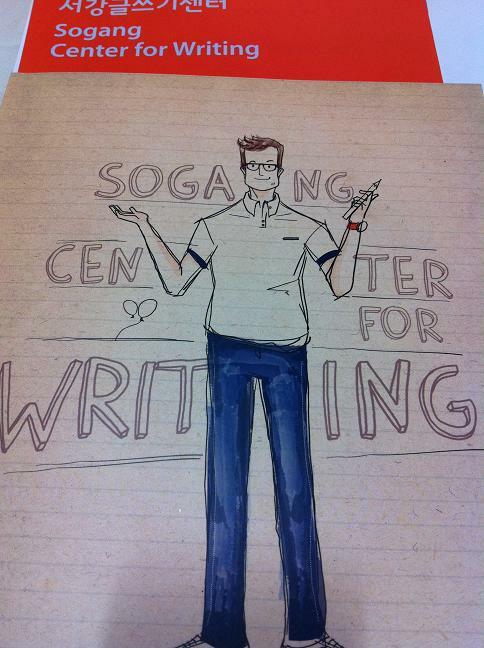 The three of us decided to attend a lecture in J building for 'Writing for thinking and thinking for writing'. The lecture was in English and initially I thought it was good for Min Young to practise her listening skill but halfway through the lecture, almost half of the participants were either sleeping or chatting with each other so we decided to walk away. Hihi..so that's it for today..tomorrow? Lesson 2 will start and I think I want to visit Ewha University on foot. I heard that the university is really pretty unlike Sogang.